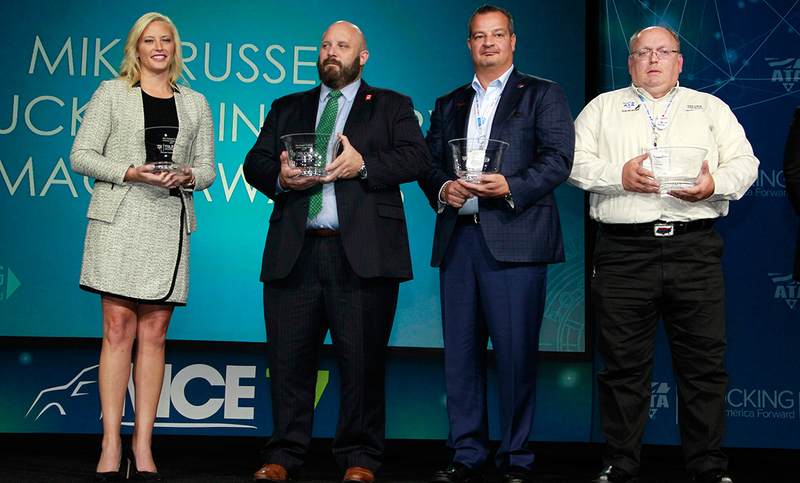 ORLANDO, Fla. — American Trucking Associations honored a professional truck driver, a state trucking association, an industry nonprofit and a motor carrier with the ninth annual Mike Russell Trucking Image Award. The awards were presented Oct. 23 here at ATA’s annual Management Conference & Exhibition. • The Arkansas Trucking Association Foundation for its efforts to leverage local relationships to amplify the American Trucking Associations national agenda, and setting an example of how to build a network of advocates who positively represent the trucking industry. • Load One for its substantial involvement in the Trucking Moves America Forward image campaign and companywide efforts to elevate pro-trucking statements through image programs, trailer wraps and work in the local community. • Truckers Against Trafficking for outreach in the community, on social media and on the highways to combat human trafficking. • Herschel Evans of Holland Inc. for representing the industry through his role as an America’s Road Team captain, lifetime commitment to safe driving and establishment of the “Safety Drive for a Cure” truck driving competition to support the Pediatric Brain Tumor Foundation. The Mike Russell Trucking Image Awards are named in honor of the late Mike Russell, a former ATA vice president of public affairs.